Keep up to date with news and events happening at Plymouth-Trinity! For upcoming church and community events, please see the Calendar. Our minister Samuel, along with Florence, Malekesa, Ésaïe, Armel and Hubert, contributed to the French-language United Church online magazine Aujourd’hui Credo, on the musical production SLĀV, which was performed here in Sherbrooke last month. The thoughtful package can be found directly at this link. You'll find an interview with Manon Massé, the co-spokesperson for Quebec Solidaire, here, en francais. New Regional Council newsletter, Nouvelles Nakonha:ka News. 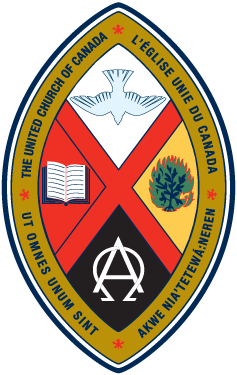 There’s a new local United Church weekly to be published every Friday! It will include important area information, news and events of interest. You’ll find a copy posted on the bulletin board in the Plymouth-Trinity Hall (under a new blue banner, for easy visibility). And you can request an esubscription by sending email to Judy Coffin, at JCoffin at united-church.ca . You’ll also find our region on Facebook at Conseil regional Nakonha:ka Regional Council (formerly 13) at this link on Facebook and on Twitter @Nakonhaka_uccan . Let's go camping! Venez faire du camping! Our theme this summer is “Radical Welcome” and we cannot wait to meet you! The United Spirit Camp is looking for campers and youth over 16 to be counsellors at this one-week-long sleepaway camp (you will receive an honorarium). Website: sites.google.com/view/campunitedspirit/home , or find us on FaceBook. Keep in touch! Use Facebook, email... and check us out here regularly! Plymouth-Trinity wants you... to keep in touch! Want to stay in the loop? Let us count the ways. First, this website. The Calendar is updated weekly, and our News section features new content weekly, as well. Our Sunday Bulletins, which include at least a couple of pages of announcements and notices of upcoming events, can be found every Friday in the Bulletin section! We have a Facebook page (find us at here , and you can tag us @PlymTrin. Our email is PlymouthTrinityChurch@gmail.com, and the office secretary is at 819-346-6373. In order to reduce clutter and confusion in the building and to ensure your belongings are returned to you (or at least are safe) please label all items you bring to church. Lost and found: Have you misplaced something in the church? A Lost & Found box can be found in the church hall, right next to the elevator.